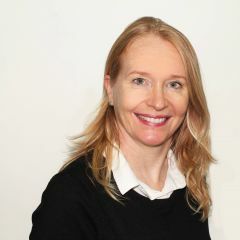 There are recent developments in the controversy regarding Belo Monte Hydroelectric Plant and its dams. The world's third largest in energy capacity is to be built in heart of the Amazon, in Brazilian state of Pará. On June 1, 2011 Ibama‘s (Brazilian Institute of Environment and Renewable Natural Resources) current president, the lawyer Curt Trennepohl, did what his predecessors had refused: he approved Belo Monte's license for construction [pt]. Especially since 2008, when former Minister of Environment Marina Silva resigned, federal environmental bodies offered resistance to granting the project a full license of construction. The project has been opposed by indigenous populations [pt] and environmental organizations throughout the country. Nevertheless, these movements haven't been enough to convince the Brazilian government to change its mind about the plant. Belo Monte is expected to be completed by 2015, with a planned capacity of generating 11,000 MW [pt] of power to supply 26 million citizens. 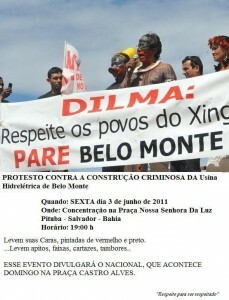 "Dilma: Respect the peoples of Xingu, STOP Belo Monte"
The Federal Public Ministry of Pará has advocated against the project. Following the resignation of the past president of Ibama, it officially issued a recommendation for Ibama's newly appointed leadership to reject the dam's license of construction. Not even the appeal issued in early April [pt] by the Interamerican Commission of Human Rights (IACHR) of the Organization of American States (OAS) was able to achieve any kind of influence. With the appeal, the OAS responded supportively to a complaint filed by indigenous and environmental advocacy groups, granting a precautionary measure for the local communities. The government answered with a press release which considered IACHR's [pt] demands “precipitated and unjustifiable”. The Brazilian Senate rejected the organization's decision [pt] and approved, on June 11, a vote of censorship to the OAS [pt]. Mesmo que ele não quisesse mudar uma pedrinha no planejamento da hidrelétrica, poderia ter respondido de forma amena, enrolando a história, passando a imagem de democrata preocupado com as minorias e de respeitoso às demandas de organismos internacionais, enquanto faria o seu trabalho de rolo-compressor nos bastidores. Even if the government did change not a single bit of the hydroelectric project, it could have responded in a mild manner, finessing it, passing along the image of a democratic country concerned with its minorities and respectful of the demands of international bodies, even while carrying on with its job of bulldozing on the backstage. Troque a foto do seu perfil pela foto de um índio do Xingu. E vamos parar Belo Monte. Compartilhe. Essa é a nossa tribo. Somos todos índios! Change your profile picture for a photo of a Xingu indigenous person. And let's stop Belo Monte. Share this message. This is our tribe. We are all indigenous peoples! On the afternoon of May 20, members of the indigenous communities of the Xingu River Basin were in São Paulo, where they demonstrated against Belo Monte in front of the São Paulo Museum of Art (MASP). Não sou defensor de Belo Monte, muito pelo contrário. 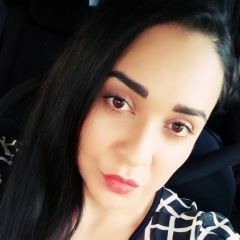 Sou totalmente contra a construção daquela usina, que poderá inundar mais de 500km² de floresta e, de quebra, prejudicar muitos indígenas. Mas também sou contra a divulgação de boatos. Se é para impedir Belo Monte de ser construída, que seja com a verdade, não com mentiras. I'm not in favor of Belo Monte. To the contrary, I'm totally against the construction of this plant, which will flood more than 500km² of forest and, on top of that, harm many indigenous communities. But I'm also against spreading rumors. If we want to avoid the construction of Belo Monte, we shall do it with the truth, instead of lies. PROTEST AGAINST BELO MONTE by Lucas Tanajura on Vimeo. 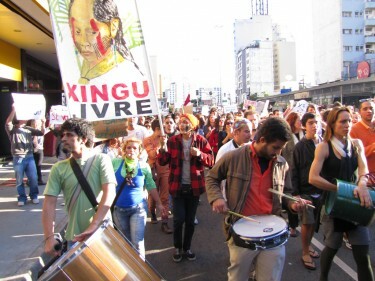 National protests were called for June 5 and 19 in the cities of Salvador, Rio de Janeiro, Campo Grande and São Paulo, as reported by the website Xingu Vivo [pt]. On the agenda, besides the rejection of Belo Monte hydroelectric dam, protesters also criticized another relevant issue: the approval of the controversial new Forestry Code in the Chamber of Deputies. With faces painted to resemble the Xingu indigenous peoples, protesters played drums all along the march and spread critical messages on posters and banners. Protest against Belo Monte in São Paulo, on June 5. Posters say: "Xingu, forgive me! ", "Wind power!" and "For the animal rights!". Photo by Flickr user Guima-san, shared under Creative Commons license (CC BY 2.0). Protest in São Paulo, on June 5. Posters read: "Don't support this crime!!!" 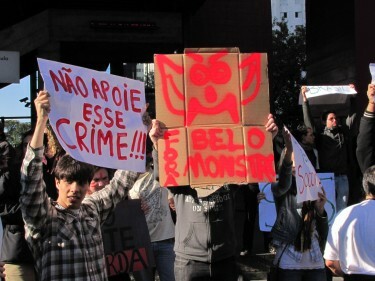 and "Out of here, Beautiful Monster" (Belo Monstro, playing with Belo Monte). Photo by Flickr user Guima-san, shared under Creative Commons license (CC BY 2.0). Protest in São Paulo, on June 5. 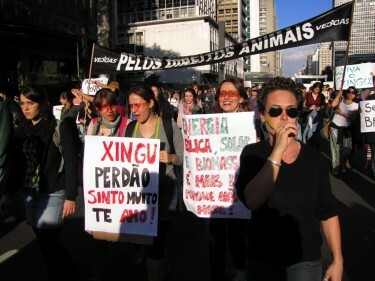 The banner reads "Free Xingu". Photo by Flickr user Guima-san, shared under Creative Commons license (CC BY 2.0). Critics of the project promise more mobilizations. On June 16, advocacy groups working with the Xingu River Basin communities, in Pará state of the Amazon forest, once again appealed to the international level. They filed a petition with complaints against [pt] human rights perpetrated by the Brazilian government, as it did not conduct proper consultation of local peoples and for ignoring the cautionary measure issued the by the InterAmerican organization in April. Brazil may be brought before the OAS InterAmerican Court of Human Rights for judgment. Meanwhile, families in poorer areas of Altamira likely to be flooded by Belo Monte dam have begun to search for abandoned properties [pt] to occupy on the town's outskirts, and there are already reports of police resorting to force [pt] against the occupations. BELO MONTE, ANNOUNCEMENT OF A WAR from André Vilela D'Elia on Vimeo. To understand the case: Two other posts analyze Belo Monte hydroelectric plant in the period preceding the approval of the construction license in June by Ibama: The Xingu river is no place for Belo Monte (October 2010); and Belo Monte dam returns to the spotlight (January 2011).